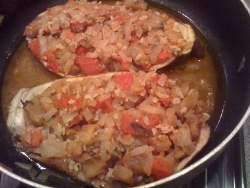 This is a typical recipe for eggplant brought to Israel by Turkish immigrants. Cut eggplant in half, scoop out pulp, cube and fry with onion. Add tomatoes and rice, salt, pepper, cinnamon and mint. Fill in shells and steam in a covered pot adding a little oil. Add wine and lemon juice. Made this dish but served it warm - not sure if it makes a difference. If I make it again I'll add some crushed red pepper or cayenne to give it some kick.